NEW YORK — With a two-point lead and Saint Louis able to hold for the final shot, Pittsburgh coach Jeff Capel gave his team clear instructions during a timeout with 18 seconds left: If Hasahn French touches the ball, foul the Billikens’ worst free throw shooter. French — who is 12.5 percent from the free-throw line this season — had a chance to tie the game with 4.9 seconds left and his team down two. But he air-balled the first shot of a one-and-one, and Pitt beat Saint Louis 75-73 on Wednesday. It was a back-and-forth game with 15 ties and 12 lead changes before Pitt took the lead for good on Xavier Johnson’s layup with 1:19 left. He hit a pair of free throws with 4 seconds left to keep the Panthers undefeated at 6-0. Johnson finished with 20 points after just three points in the first half due to foul trouble. Ellison and Sidy N’Dir both scored 13 points for the Panthers. Saint Louis (4-1) was led by French, who had 13 points and 10 rebounds, and Jordan Goodwin, who scored 16. 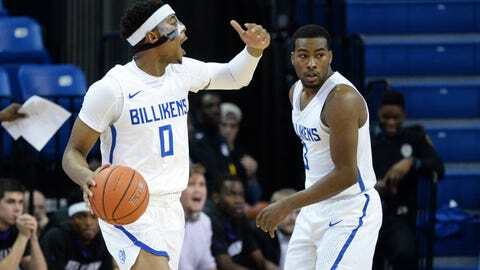 Saint Louis: Picked to win the Atlantic 10 Conference in the A-10 coaches and media vote, the Billikens look the part thus far, following up their victory at Big East foe Seton Hall with a down-to-the-wire game against an ACC opponent. Pitt: The Panthers are undefeated thanks in large part to a soft schedule. But Capel appears to have the Panthers heading in the right direction. Saint Louis received six votes in the latest AP Top 25. Pitt hasn’t received any votes despite its undefeated start due to the caliber of opponents. Ford didn’t seem pleased with the officiating as he saw several players get into foul trouble, including three starters ending the game with four fouls. Saint Louis: Hosts Central Arkansas on Saturday. Pitt: At Iowa on Tuesday for the ACC/Big Ten Challenge.